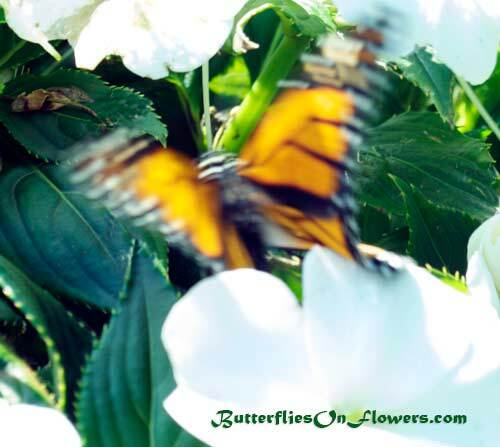 Caption: A Monarch Butterfly (Danaus Plexippus) wildly flaps his wings over some white flowers. This is definitely not one of my best photos. It's overexposed as I should have adjusted the aperture to let in less light. I did not intend for the butterfly to be blurred in motion but I thought it was kind of an interesting effect. I'll let you be the judge. Butterfly facts: The in-flight adult will flap her wings around 5-12 times per second and up to 720 times a minute. This is slower than most butterflies and tortoise-like compared to the hyper-winged hummingbird!